ESO, the European Southern Observatory (formally known as the European Organisation for Astronomical Research in the Southern Hemisphere), is the foremost intergovernmental astronomy organisation in Europe and the world’s most productive astronomical observatory. ESO provides state-of-the-art research facilities to astronomers and is supported by Austria, Belgium, Brazil*, the Czech Republic, Denmark, Finland, France, Germany, Italy, the Netherlands, Poland, Portugal, Spain, Sweden, Switzerland and the United Kingdom. Several other countries have expressed an interest in membership. ESO’s main mission, laid down in the 1962 Convention, is to provide state-of-the-art research facilities to astronomers and astrophysicists, allowing them to conduct front-line science in the best conditions. The annual member state contributions to ESO are approximately 198 million Euros and ESO employs around 700 staff members. 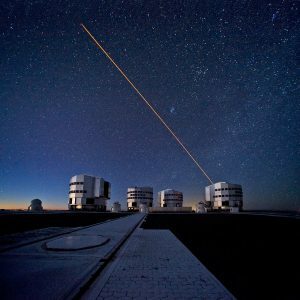 By building and operating a suite of the world’s most powerful ground-based astronomical telescopes enabling important scientific discoveries, ESO offers numerous possibilities for technology spin-off and transfer, together with high technology contract opportunities and is a dramatic showcase for Europe. Whilst the Headquarters (comprising the scientific, technical and administrative centre of the organisation) are located in Garching near Munich, Germany, ESO operates, in addition to the Santiago Centre, three unique observing sites in Chile: La Silla, Paranal and Chajnantor. At Paranal, ESO operates the Very Large Telescope, the world’s most advanced visible-light astronomical observatory, and two survey telescopes. VISTA works in the infrared and is the world’s largest survey telescope, and the VLT Survey Telescope is the largest telescope designed to exclusively survey the skies in visible light. ESO is the European partner of a revolutionary astronomical telescope, ALMA, the largest astronomical project in existence. ESO is currently building the 40-metre-class European Extremely Large optical/near-infrared Telescope, the ELT, which will become ‘the world’s biggest eye on the sky’. * Brazil is in the process of finishing the ratification procedure.